NEW YORK (CNN) -- Hundreds of people converged on New York's Union Square Friday for the May Day Immigration Rally, calling for workers' rights and a path to citizenship for the country's nearly 12 million undocumented immigrants. 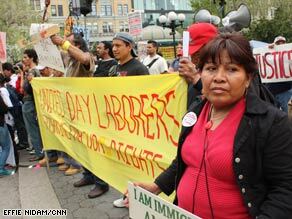 New Yorker's support the rights of undocumented workers on Friday at a May Day rally. The annual event, which began in 2006, was organized by the May 1st Coalition for Workers and Immigrants Rights. Similar rallies were scheduled across the nation in Boston, Massachusetts; Detroit, Michigan; Pittsburgh, Pennsylvania; San Diego, Los Angeles and San Francisco in California, and San Antonio, Texas, according to the group's Web site. Following rally cries from speakers in both English and Spanish, demonstrators braved a rainstorm and marched approximately two miles to New York's Federal Plaza. Among the participants was Saul Linares, who emigrated from El Salvador six years ago and works at a Long Island factory making equipment for the U.S. Army. Linares is particularly concerned about children who are American citizens, yet whose illegal immigrant parents have been deported. "The children are living alone, sometimes with relatives, at churches or with neighbors," he said. Teresa Gutierrez, a co-coordinator of the event, blames current government policy for the United States' immigration woes. She said she believes the Clinton administration's landmark 1994 North American Free Trade Agreement, or NAFTA -- which was meant to promote cross-border growth between the United States and Mexico -- actually had exploitive effects on the Mexican population. "Immigrants came because of NAFTA. They don't risk their lives crossing the border because they want to, but because they have to," she said. A smaller anti-illegal immigration rally assembled across the street, organized by the New Yorkers for Immigration Control and Enforcement. Charles Maron, a New York firefighter and husband of a first generation Pakistani, believes illegal immigrants who commit crimes should be deported. "Someone who comes, teaches their kids the American way, I support that." Participants in the May Day rally included people from Latin America, Africa and the Middle East. According to Gregory Jesus Luc, who is producing a documentary about the plight of Haitian immigrants, "It's about awareness, letting media and America know that we are immigrants and we are the backbone of this country."